Immobilization is one of the most used procedures to prevent spinal cord injury in multiple trauma patients in prehospital setting. However, its protocolary use has historical principles rather than a scientific origin. Although this technique restricts the movement of the injured spine, there is no evidence supporting its use in all patients suffering from trauma. To contrast the effectiveness of immobilization in multiple trauma patients. A bibliographic narrative review was carried out in databases such as PubMed, CINAHL Complete, ScienceDirect, Cochrane Plus and LILACS. A total of 12 articles were obtained that met the inclusion and exclusion criteria established and answered the proposed objective. The current literature does not clarify universal criteria about when patients should be immobilized. In addition, the great amount of harmful effects that can cause this technique to the patient are increasingly manifested. It is necessary to carry out more studies that provide scientific evidence of quality to know the effectiveness of cervical immobilization in multiple trauma patients, because this is still something uncertain. The concept of multiple trauma includes all those patients who have traumatic injuries that affect at least two or more organs (or more than one system), and in which at least one of these injuries can compromise the person's life [1,2]. Traumatological user represents 12% of the world burden of disease and the first cause of death in people between the age of 1 and 44. Collisions between vehicles cause more than 1 million deaths per year and between 20 and 50 million significant injuries. Although the fight against this problem should be approached in a preventive manner, once the trauma has occurred, efforts should be directed towards avoiding preventable deaths and reducing disability [3-5]. The bony column can withstand energy forces of up to 1,360 Joules under normal conditions. Any patient traumatized with a mechanism of injury of a greater energy transfer to the mentioned can present spinal damage . Epidemiologically, 55% of all spinal lesions are cervical, 15% thoracic, 15% thoracolumbar and 15% lumbosacral, the most common being C4-C5-C6, T4-T5 and T12-L1. There are two types of differentiated spinal injuries: Primary and secondary [3,6]. An excessive movement of hyperflexion, hyperextension or hyper rotation in a patient with a spinal cord injury, can cause a bone compression that causes irreparable damage and paralyzes the patient for life. The American Spinal Injury Association (ASIA), in consensus with the International Medical Society of Paraplegia (IMSOP), developed criteria to accurately define the exploration (both sensory and motor) of the spine to determine the degree of involvement . In this type of accidents, the use of cervical immobilization is widespread. Its purpose is to reduce the primary lesion and prevent the progress or appearance of secondary [3-8]. Traditionally, the existence of a spinal cord injury was based only on the type of trauma and the mechanism of the injury. Therefore, cervical immobilization was essential for any patient who had suffered a trauma of these characteristics. This generalization has led to the lack of clear clinical criteria that assess the traumatisms of the spine and determine whether the patient requires immobilization . It is important to know in what position the patient must remain, who may have a spinal cord injury and what materials should be used to immobilize him in each case. Regarding the position, the clinical evidence resulting from both the imaging tests and from the patient's own experience suggests that the head-neck-trunk neutral alignment should be chosen. Schriger, et al. defined this concept as the "normal anatomical position of the head and torso that is supposed to be standing and looking forward" [5,6,9-11]. As for the materials to be used in the immobilization, the maneuver of mandibular elevation (manual immobilization), the cervical collar or other means will be chosen, according to the circumstances in which we find ourselves. Often too much attention is devoted to certain immobilization devices without really understanding what operating principles they have and how they should be used to meet the individual needs of each person. In general, the materials needed to immobilize the spine are: A cervical collar, a pair of supports placed on each side of the head and boards (long or short) with associated strips to keep the patient's body fixed to the so-called "spinal board" [5,10]. However, there are problems when defining the best immobilization method for prehospital transportation due to both ethical and physical restrictions. These barriers are due to the fact that people seriously ill or with a serious disability (as in this case) are considered a vulnerable population. These groups have been defined by three of the main ethical guidelines: The Belmont Report (1979), the Declaration of Helsinki (1964) and the ethical guidelines of the World Health Organization (WHO) and the Council for International Organizations of Medical Sciences (CIOMS). Here it should be clarified that the Declaration of Helsinki, although adopted in 1964, has been updated seven times, the last one in the General Assembly of October 2013. The same is true of the guidelines created by WHO and CIOMS, since if they were established in 1982, the last modification was made in the year 2002. These versions are the last and therefore re-invent the previous texts, which is why they should be taken into consideration. Given the relevance of the issue, only studies that have been approved by an ethical committee or commission will be incorporated into the present work [10,12-15]. Currently the usefulness of cervical immobilization is being questioned. Although this procedure is still recommended by many references, immobilization subjects most patients to very expensive, painful and even potentially harmful treatments, with little or no benefit. To understand the reason for these changes, it is necessary to know the mechanisms of injury, physiology and biomechanics applied to spinal injuries [16,17]. According to Hauswald and his colleagues, for a spinal injury to occur, it is necessary to exert a very important force that causes axonal necrosis, so that the movements after the trauma are "irrelevant". For it to occur, a high amount of energy trauma is necessary, so the manipulation of the spine (which includes extraction, transport, etc.) is not a major cause of secondary injuries . Another point to keep in mind is that when immobilization is not necessary it can expose patients to various adverse effects such as iatrogenic pain or ulceration of the skin. In addition, it can cause aspiration and compromise the ventilation of the person, creating difficulty to permeabilize the airway. These last sequels are given a great importance because they can produce a death by asphyxia, having been avoidable. Therefore, some authors do not exclude the possibility of even increasing morbidity and mortality in certain situations [9,17]. Likewise, the immobilization of a multiple trauma patient involves the taking of x-rays and, therefore, the exposure of the person to radiation (sometimes unnecessary). This, in turn, entails a longer hospital stay for the patient and higher social and healthcare costs. Other adverse effects that this procedure can cause, and which have been determined by observational studies, are increased intracranial pressure, increased risk of aspiration, dysphagia and even tissue ischemia . In this context, it has been considered appropriate to conduct a review of the current literature (considering as current no more than eleven-years-old, due to the continuous change in the procedures of action) whose main objective is to clarify whether the use of cervical immobilization is beneficial in multiple trauma patients. •	To contrast the efficacy of cervical immobilization in multiple trauma patient compared with non-immobilization. •	To describe the effects of immobilizing a multiple trauma patient when the spine is unstable. •	To describe the different types of cervical immobilization and examine its efficacy in multiple trauma patients. •	To identify the using criteria for cervical immobilization. In order to carry out our purpose, a narrative bibliographical review has been carried out in different databases, such as PubMed, CINAHL Complete, ScienceDirect, Cochrane Plus and LILACS. DeCS thesauri (both English and Spanish) and MeSH terms have been used as can be seen in Table 1. These terms have been linked by the Boolean operators "AND" and "OR". In addition, exclusion and inclusion criteria were established to refine the search, which have been recorded in Table 2. Find equations that have been used to produce until January 2017. The review in each database is shown below in Table 3. After reading the title and adapting to the purpose of the review, selection by title and summary, as in the extraction phase in critical reading , has always been carried out in pairs, consulting the discrepancies with a third author. According to Bledsoe, there is little evidence supporting the use of spinal panels, so when using them, the damages that may result must be considered. Modern practices should be based on the best scientific evidence available, and those which do not have obvious benefits should be abandoned. This article refers to the American Heart Association, whose recommendations are based on the best scientific evidence available, creating a much simpler and more effective approach to emergency situations. These strategies should be applied similarly to prehospital care practices, such as the use of boards . This expert opinion article coincides with that of Collopy, et al. who declare that the spinal boards do not provide an empirical benefit. They also state that the rates of vertebral injury in this type of patient are between 2%-5%, a range that decreases to less than 2% if specifically related to cervical lesion. Given the situation posed, it can be conjectured that the most of patients immobilized in such boards may not even present a real lesion . According to this, the complications of the use of spinal boards have been described by a huge number of authors. Sporer and Wampler, et al. consider the most important are pain, anxiety, mild respiratory compromise and greater difficulty in the management of the airway, pressure ulcers, increased intracranial pressure and, in exceptional cases, can distract from unstable fractures. Immobilization also implies a greater use of unnecessary radiological tests, thus increasing the radiation to which the patient is exposed. This is due to the difficulty in distinguishing whether the pain is a result of the traumatic injury or is caused by the spinal panel [22,23]. Questioning whether there are alternative devices to immobilize patients, Wampler, et al. conducted a randomized clinical trial in healthy volunteers to compare the efficacy of the spinal board versus vacuum mattresses. Five of the nine participants were assigned to the spinal panels, while the other four were assigned to the vacuum mattress. The study reveals that the spinal panels allow a greater displacement of the patient and, most importantly, more movement of the torso in relation to the head, in the cervical area. From a physical point of view, it makes sense that a hard, flat and smooth surface does not impede lateral movement compared to a softer surface and a shape more adapted to the body . •	First, the participant had to know how to instruct someone external (in this case the supervisor) to perform the manual stabilization. •	Next, after removing the clothes from the upper part of the body, the neck length of the test wrist should be measured. For the collar to fit perfectly, the recommendation is that it has the maximum neck length. After adjusting the size (previously determined), the cervical collar had to be blocked four times. •	Finally, the chin portion of the collar should be bent before placing the device correctly on the training wrist. Despite the safety of the study participants, only 11% correctly placed the device (the most common error was an incorrect size choice). Therefore, it is clear that there is a generalized deficit in the practical skills of health professionals in the placement of collars . Regarding the issue of knowledge deficit, this circumstance is also observed in the study by Conrad, et al. Its object of study are the different techniques of transferring a patient in prone to a board or stretcher. With five fresh corpses that had an unstable column, two traction maneuvers to neutral position were executed: Push and pull. For both techniques five people are needed . In the first technique (print) a person remains in the head of the patient and stabilizes the column manually and three others are placed along the body, on the side opposite to the direction in which the head of the patient is placed. One of them is positioned on the shoulders, another on the hip and the last, on the legs. The fifth professional is responsible for the spinal board. Who immobilizes the head initiates the process. When it does, the three people next to the patient's body rotate slowly while the last one places the board between the body and the floor . The second technique (pushing) changes is the position of the three people on the patient's body. In this case, they are placed on the same side as the patient's head. The rest of the procedure is similar to previous one . When performing this study, a slight difference in movement was observed between the two procedures, with less anteroposterior displacement and less lateral flexion with the push technique. From the reading it is extracted that the exposed push technique could be adopted as a preferred maneuver for the mobilization of a patient who is prone. Even so, further studies should also be carried out in search of a procedure that further reduces the movement of the unstable spine . The article by Collopy, et al. refers to the Kendrick® extraction device. It is a mobilization device, which means its utility lies in the extraction of patients trapped in vehicles suspected of having cervical injuries. This trial reports that it causes more movement in the spine than a "self-excision" of the patient wearing a cervical collar. This issue was also addressed by Bucher, et al. , who compared the application of Kendrick® with rapid extraction by emergency services professionals. The sample consisted of 23 subjects in two scenarios: One using rapid extraction without using the Kendrick® and the other involving said device. The time was significantly shorter using the rapid extraction for all the patients, however the angles of rotation of the head were also greater. Therefore, in contrast to the previous study, in this experiment a decrease in the movement of the patient's neck was shown using the Kendrick® extractor [21,26]. These two theories are opposed, but the study by Bucher, et al. , having a higher methodological quality, takes precedence over the previous one. However, more scientific evidence would be needed to determine if the Kendrick® extractor significantly improves patient outcomes in prehospital care . •	Neurological results were neutral in terms of immobilization: There was no improvement or worsening in the patients. •	Regarding the effect of cervical immobilization on the positioning of the spine, all studies supported its use to achieve correct alignment of the same. In adults also, the use of the occipital filling was recommended. •	Regarding the prevention of movement, most studies affirm that the immobilization prevents any movement on the part of the patient. •	As far as complications are concerned, in all the trials it was shown that this procedure causes, to a greater or lesser extent, adverse effects. •	Ultimately, regarding to harm and comfort, all references point to immobilization causing pain and discomfort to the patient. The main objective of carrying out this bibliographic review is to compare the efficacy of immobilization versus non-immobilization in multiple trauma patients. As explained previously, for knowing the effectiveness of the immobilization, it is important to know the effectiveness of the materials used in it. Also, it can be deduced that the professionals that carry out these procedures must practice for having dexterity and perform them in an appropriate manner [24,25]. About the effectiveness of the immobilization, despite these results, and due to the low methodological quality of the same, more studies should be carried out. Kwan, et al. obtained a similar result in their systematic review with meta-analysis. In addition, the authors also contacted the manufacturers of spinal immobilization devices to obtain information. After studying 4,438 potentially relevant papers for this review, none fulfilled the inclusion criteria established by the reviewers. The authors declare that the origin of immobilization has more historical than scientific precedents, which are based on the concern that if a multiple trauma patient is not immobilized, it can deteriorate neurologically. Although not included for not meeting the inclusion criteria (it is an article with more than 10-years-old), the Hauswald, et al. study, which has already been mentioned in the introduction of the present, should be named given its importance and methodological quality job. This author points out that a shock with a large energy transfer is needed to fracture the spine, therefore, it is unlikely that the movements due to the accident will aggravate the damage of the spinal cord. On the other hand, this review presents clinical criteria to identify patients who have a low risk of cervical injury. This point is very important, since according to some studies such as that of Vaillancourt, et al. Approximately 40% of patients with a low risk of vertebral injury could be transported safely without the need for cervical immobilization. The need for this study arises because of all the patients who transport Canadian emergency services annually (1.3 million), less than 1% have a fracture of the spine and even less (0.5%) suffer an injury of the spinal cord. In addition, most of their injuries occur before the arrival of the health professional, not during transport, making cervical immobilization and subsequent radiological tests unnecessary . In this cohort study carried out in Canada, Vaillancourt, et al. they validated the "Canadian C-Spine Rule" protocol , applying it to 3,000 stable patients with a traumatic brain injury. Based on the results of this work, and before such a considerable number of people who do not require immobilization, it seems necessary to create protocols or criteria that establish a guide regarding to the choice of patients to whom it is immobilized. To this must be added the reports on the disadvantages of immobilization, which mean that the indications for carrying it out must be more specific . Kreinest, et al. They carried out a bibliographic search in 2016 incorporating studies from 1980 to 2014 with the same objective as the previous author: To establish clinical criteria on the use of immobilization. Based on this literature and current guidelines, the "Emergency Medicine Spinal Immobilization Protocol" (E.M.S. IMMO Protocol) for multiple trauma adults was developed . This one supports decision-making regarding the immobilization of the spine and was validated by two tests. Two surveys were carried out both to the rescue personnel and to the emergency physicians who participated in the study. The questionnaire included four questions about the applicability and ease of use of the protocol, which was reviewed based on the results of the first interview. Later, it was reevaluated with the same questionnaire but by emergency professionals who had not been included in the study . To understand the protocol more easily, first must be understood the different types of immobilization that exist. The first immobilization is established manually. Then the minimal immobilization is performed with only a cervical collar. Finally, the complete immobilization includes the use of all the devices at the same time (spinal board, collar, elche lady and the holding straps) . Since the treatment of multiple trauma patients is based on the principles of ABCDE, the IMMO Protocol also relies on this foundation. Depending on the condition of the patient, different indications are followed to immobilize the spine. Whenever possible, spinal immobilization should be performed immediately, in the initial contact with the trauma patient. To avoid the delays caused by the placement of a cervical collar, it must be developed manually and must be maintained throughout the ABCDE assessment. In addition, whenever possible, all procedures performed on the patient should be performed with a minimum of stabilization of the spine . If the evaluation of a patient is determined to be hemodynamically unstable, transportation to the hospital is the highest priority. In the case of blunt trauma, immobilization can be performed using only a cervical collar. Although the exclusive use of it does not adequately restrict the movement of the spine, residual mobility is accepted in this case bearing in mind that complete immobilization would delay rapid transport and could therefore lead to an increase in mortality. According to the evidence, patients with unstable circulation after penetrating trauma should not be immobilized, as the benefits are highly questionable . Regarding the evaluation of the neurological deficit, one must determine if there are signs of severe brain injury or an increase in intracranial pressure. In case these symptoms appear, the E.M.S. IMMO recommends that the cervical collar is not used because it can increase the pressure. If there is a traumatic brain injury in this type of patients, it is recommended that the immobilization be done on the vacuum mattress and that the body be kept elevated at 30° . Patients who are hemodynamically stable and who have no evidence of increased intracranial pressure should have their clothing removed for examining them in more detail. Then you must determine if the patient's condition can be fatal. If so, the priority is hospital transport, so only a cervical collar will be placed for the same reasons as described above. If, on the other hand, the patient is stable, the indications for performing immobilization will be assessed . ✓	Closed trauma and low level of consciousness. ✓	Neurological symptoms (numbness, motor weakness, hyposensitivity ...). ✓	Anatomical deformity of the spine. ✓	High energy transfer injury accompanied by intoxication due to substance abuse (drugs or alcohol), inability to communicate, or injuries that may distract from a cervical injury (for example, a femur rupture). ✘	Normal level of consciousness (Glasgow = 15), no finding of neurological symptoms. ✘	There is no pain in the spine or any anatomical abnormality. ✘	There are no injuries that distract from the cervical lesion. ✘	The patient is not intoxicated by any harmful substance. Despite existing recommendations like the previous ones, it should be highlighted that there are no universal criteria because there is little scientific evidence in this regard. More studies should be conducted that could clarify this issue. The scarcity of bibliography of high methodological quality is because of the fact that multiple trauma patients are considered a vulnerable population. Vulnerability is defined as “The degree by which an individual, population or organization is unable to anticipate, face and recover from the impacts that may cause, in our case, the proposed research”. We are all such vulnerable since it is a basic characteristic of the human being. However, there are some individuals who, due to added factors (having a serious disability or social and economic conditions), require greater protection in researching. This is the case of multiple trauma patients, so the lack of studies of good methodological quality is mainly due to this reason. Although comparative studies of the various devices have been performed in healthy volunteers, none have been tested in a sufficiently large sample of patients with spinal cord injury. This makes it difficult to extrapolate the data obtained in healthy people to patients injured or with spinal instability. Therefore, the majority of articles conclude that more research is needed to clarify the effectiveness of immobilization [15,23,27,28,32]. The main limitation of this work, as has already been mentioned before, is the scarcity of studies related to multiple trauma patients due to the ethical restrictions existing in this type of patients, considered a vulnerable population. Not having access to all the literature has meant another limitation, since there are articles that, being not in full text, have not been included in the present work. It should be noted that this review has also been limited by the scarcity of Spanish bibliography. Although English literature has been included, it is not certainly known if it can be applied in our field, since the Canadian or the American health system differ greatly from what we find in the current review. Finally, the in-depth reading of the articles has been carried out by only one person, which can cause the existence of confirmation bias (selective thinking by which one tends to look for that which confirms one's beliefs). •	Effects of immobilizing a multiple trauma patient with unstable spine are more historical than scientific. •	Spinal panels are not always advantageous and have harmful effects for the patient. An alternative could be vacuum mattresses, although more studies are needed to be able to insure it. •	Cervical collars are a good method of cervical immobilization (in addition to other devices), as far as the staff is trained to place them properly. •	There are no universal criteria that indicate when a patient should be immobilized. •	More studies are needed to provide quality scientific evidence to contrast the efficacy of cervical immobilization in multiple trauma patients, as it remains somewhat uncertain. (2007) Guía Clínica Politraumatizado. Santiago de Chile: Minsal. Ministerio de salud. Gómez Martínez V, Ayuso Baptista F, Jiménez Moral G, Chacón Manzano M (2008) Recomendaciones de buena práctica clínica: Atención inicial al paciente politraumatizado. Semergen 34: 354-363. Styner J (2012) ATLS - Advanced Trauma Life Support. (9th edn), American College of Surgeons, Chicago. Canabal Berlanga A, Perales Rodríguez de Viguri N, Navarrete Navarro P, Sánchez-Izquierdo Riera JA (2007) Manual de soporte vital avanzado en trauma. (2nd edn), Elsevier Masson, Madrid. Norman E (2012) PHTLS: Soporte vital básico y avanzado en el trauma prehospitalario. (6th edn), Elsevier, Barcelona. Ballesteros Plaza V, Marré Pacheco B, Martínez Aguilar C, Fleiderman Valenzuela J, Zamorano Pérez J (2012) Lesión de la médula espinal: Actualización bibliográfica: Fisiopatología y tratamiento inicial. Coluna/Columna 11: 73-76. Rodríguez Villar S (2013) Cuidados críticos: Protocolos. (2nd edn), Marbán, España. (2015) Hospital Universitario Gregorio Marañón. Protocolo de Prevención de Caídas. Quinn R, Williams J, Bennett B, Stiller G, Islas A, et al. (2014) Wilderness Medical Society Practice Guidelines for Spine Immobilization in the Austere Environment. Wilderness Environ Med 25: S105-S117. Theodore N, Hadley MN, Aarabi B, Dhall SS, Gelb DE, et al. (2013) Prehospital cervical spinal immobilization alter trauma. Neurosurgery. Guidelines for the management of acute cervical spine and spinal cord injuries 72: 22‐34. Schriger D L, Larmon B, LeGassick T, Blinman T (1991) Spinal immobilization on a flat backboard: does it result in neutral position of the cervical spine? Ann Emerg Med 20: 878-881. (1978) National commission for the protection of human subjects of biomedical and behavioral research. The Belmont Report. (1964) Principios éticos para las investigaciones médicas en seres humanos. Asociación Médica Mundial. Declaración de Helsinki. (2002) Pautas éticas internacionales para la investigación biomédica en seres humanos. Consejo de Organizaciones Internacionales de las Ciencias Médicas (CIOMS) en colaboración con la Organización Mundial de la Salud (OMS). Florencia Santi M (2015) Vulnerabilidad y ética de la investigación social: Perspectivas actuales. Revista Latinoamericana de Bioética: 2: 52-73. (1994) Fundación Mapfre medicina. Actualización clínica: Urgencias extrahospitalarias. (1st edn), Editorial Mapfre, España. Tinoco Suárez GR, Jiménez Madiedo C, Navarro Vargas JR (2004) Estado del arte: Utilidad de la inmovilización cervical en trauma. Revista Colombiana de Anestesiología 43-53. Hauswald M, Ong G, Tandberg D, Omar Z (1998) Out-of-hospital spinal immobilization: Its effect on neurologic injury. Acad Emerg Med 5: 214-219. (2017) Evidence Oxford - CEBM. Bledsoe B (2013) The evidence against backboards: Backboards often don't help and may hurt - why do they persist? EMS World 42: 42-45. Collopy K, Kivlehan S, Snyder S (2015) Busting top trauma myths. Exploring best practices for prehospital trauma care. EMS World 44: 38-45. Wampler D, Pineda C, Polk J, Kidd E, Leboeuf D, et al. (2016) The long spine board does not reduce lateral motion during transport-a randomized healthy volunteer crossover trial. Am J Emerg Med 34: 717-721. Sporer K (2012) Why we need to rethink C-spine immobilization: We need to reevaluate current practices and develop a saner cervical policy. EMS world 41: 74-76. Kreinest M, Goller S, Rauch G, Frank C, Gliwitzky B, et al. (2015) Application of cervical collars - An analysis of practical skills of professional emergency medical care providers. Plos One 10: e0143409. Conrad B, Marchese D, Rechtine G, Prasarn M, Del Rossi G, et al. (2013) Motion in the unstable cervical spine when transferring a patient positioned prone to a spine board. J Athl Train 48: 797-803. Bucher J, Dos Santos F, Frazier D, Merlin M (2015) Rapid extrication versus the kendrick extrication device (KED): Comparison of techniques used after motor vehicle collisions. West J Emerg Med 16: 453-458. Hood N, Considine J (2015) Spinal immobilisaton in pre-hospital and emergency care: A systematic review of the literature. Australas Emerg Nurs J 18: 118-137. Kwan I, Bunn F, Roberts I (2008) Inmovilización espinal para los pacientes traumatizados. Cochrane Plus. Vaillancourt C, Charette M, Kasaboski A, Maloney J, Wells G, et al. (2011) Evaluation of the safety of C-spine clearance by paramedics: Design and methodology. BMC Emerg Med 11: 1. 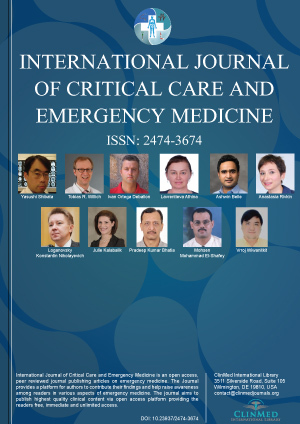 Kreinest M, Gliwitzky B, Schüler S, Grützner P, Münzberg M (2016) Development of a new emergency medicine spinal immobilization protocol for trauma patients and a test of applicability by German emergency care providers. Scand J Trauma Resusc Emerg Med 24: 71. (2013) National Association of EMS Physicians and American College of Surgeons Committe on Trauma. Position Statement: EMS Spinal precautions and the use of the long backboard. Prehospital Emerg Care 17: 392-393. Garzón Díaz F (2009) Aspectos bioéticos del consentimiento informado en investigación biomédica con población vulnerable. Bioética 9: 8-27. D Peña Otero, RN, MSc, MRes, PhD, Professor, Zapatón Health Center, Health Service of Cantabria; Nursing Group, Gregorio Marañón Health Investigation Institute (IiSGM), Madrid, Spain. © 2019 García SC, et al. This is an open-access article distributed under the terms of the Creative Commons Attribution License, which permits unrestricted use, distribution, and reproduction in any medium, provided the original author and source are credited.